Nearly all the updates had passed the K100 LT without traces; while the sportier versions meanwhile featured paralever chassis, 74 kW/100 HP and four-valve heads (and unlike the LT could be ordered with controlled catalytic converter system), the LT was build unchanged with 66kW/90 HP and Monolever. It is interesting to know, that the K100 designers always had to defend their engine concept with 66 kW against journalists and clients claiming 100 HP flat. When BMW finally folded, the torque suffered: torque diagram showing a deflection between 4000 and 5000 RPM. Those, who bought the sports models could live with it, performance and rev potential being excellent, the touring rider however demanded different qualities, rather be found in the earlier engine. That's why the due update of the LT just jumped the 1000cc four valve at the end of 1991. The four valve was bored to 1092 cc, stroke unchanged, also the Bosch Motronic- system was updated to version 2.2, resulting in an engine, which as much beat the torque of the first K100 as the performance of the K1. Vibrations could still be sensed with this 1100, but there was no doubt that this was the superior 100 HP- engine. In the diagram below the differences in torque and performance of the different four- cylinders. The new engine however was only one of the modifications to push the K1100 LT back into the top rank of tourers. A modified fairing enclosed the engine even more. The windscreen position could be changed electrically. Interesting because the windscreen of the old K100 RT when sold abroad, was changed to a steeper position by fitting wedges. Now the screen was adjustable, which especially pleased the ‘big ones’, the fairing was moved 30mm forward to allow more leg space. After all there was a controlled catalytic converter available,additional price just 850 DM. ABS cost 1995 DM. Already in 1992 it was possible to pay 28,500 DM for a fully equipped LT. For that you got radio with remote control, heated grips and burglar alarm. The topcase, already standard with the earlier model was enlarged to 35 l. Two pretty well- equipped special editions were offered during the time: 1993 a „Special Edition“ with G-cataliser, ABS II and Radio for 27,950 DM and 1997 the LT „Highline“ mit several chromed and polished parts, Radio and backrest. The Price 29,600 DM. It would have been illogical to supply the spots model with a smaller engine than the tourer. 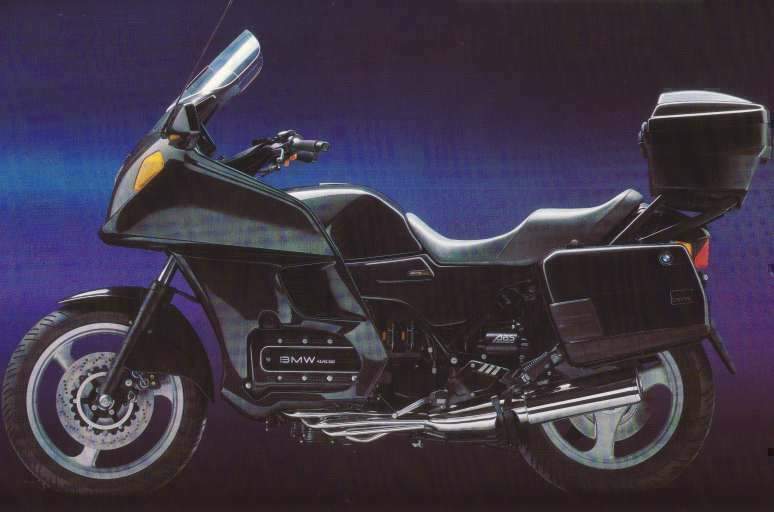 That is why in September 1992 the K1100 RS substituted the Thousand – the K1 was being build without change. Obviously changing the engine would boost the rather poor sales. The RS got a new fairing too. 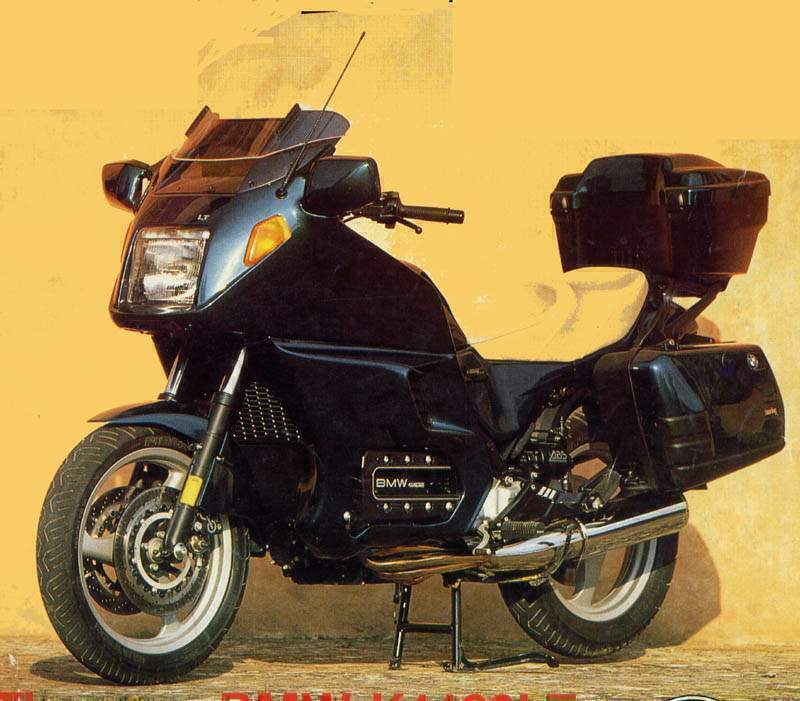 As the first K100 RS had a three-quarter- fairing, the RS 16V showed an engine- spoiler,as an option. Consequently this gap was closed with the K1100 RS and a full fairing was fitted. In contemporary tests styling elements of the Ferrari Testarossa were seen in the fairing’s air openings - less poetically inclined people mentioned, the Suzuki RF 600 to have rather similar openings. Anyway these were not just styling elements. Already with the K 100 RS engine heat made the rider suffer in summertime, so the K1100 RS with her fully enclosed fairing had to get rid of the hot air outside the fairing. The enlarged battery covers closed the gap under the tank and the beam-like silencer, as with the K 100 16V, was replaced by a cylindrical chromed one. In terms of design, this K1100 RS is for many people the most beautiful K- BMW ever. Also underneath the RS was improved: The frame again was reinforced and suspension (coming from Japan and Italy) was redesigned. Continued was the concept to fit a longer axle ratio (2,81) to the RS and a shorter one (2,91) to the LT, leaving the tourers at 130 km/h with a 500RPM higher level. Due to the higher drag of the LT the situation was left like this. Ever since the K series has been a model with ample electronics. Nearly unbelievable: BMW donned the 1100 a 700 W- alternator ( the battery however was reduced to 19 Ah). The electrically demanding ABS II, coming soon, was the reason for this. Vibrations unfortunately could not be eliminated with the new engine. The designer tried to reduce the problem with end- weights in the handlebars and discoupled footrest- supports, still it was noticeable. There was a special edition model of the RS too: 1994 in red with black writing for 25300 DM with ABS included. End of 1995 there came a last special edition in black and silver with polished frontforks. 1997 the K1200RS followed the 1100 RS, the LT going on until 1998. Since then BMW offers the K 1200 LT.